My office is renowned for being possibly the most untidy and uncoordinated room in my home. Previous attempts to revamp this room have always started with the best intentions - shelf erection, cork board wall - but always deteriorated into chaos within approximately two weeks. This is mostly due to the fact that I was lacking a proper desk. I've always loved working from an old Pieff glass dining table - plenty of space, room to spread out/make a mess. However, height wise I was struggling and had propped my computer on a box in order to raise it to eye level. My seating situation was very much lacking - a red hard plastic chair which I had picked up on eBay ten years ago. It looked good, but as well as being super uncomfortable, it was shocking to my back and as someone who spends a lot of time writing at the computer, it was a very poor choice. I also have children who are prone to watching YouTube videos on my Mac (despite having their own desks in their rooms) and it was a constant battle to remove them from the space. I work from home approximately 90 percent of the time and over the last six months had realised the importance of a workspace that was my own, both from a personal point of view but also from a productivity angle. When Humanscale contacted me and asked if I would consider trying their ergonomic office products, I needed no persuading whatsoever. After sending them a photograph of my current working area (which I am sure sent them into a decline), they sent me a proposal for some items for my office which would significantly improve my situation, from both a comfort and a health point of view. They booked a technician to come and visit my home to install the products properly for me and I sat back and waited for my previously ignored office to be transformed (whilst realising that in order to do so I would need to tidy up). So who are Humanscale and what do they do? Humanscale designs have received more than 200 awards since 2007 and appear in various museums, including the Museum Of Modern Art. Their Design Studio is based in New York and they abide by the philosophy that good design achieves more with less. As a result, they regularly collaborate with industrial designers, most notably Niels Diffrient. He was instrumental in the mid century modern design movement and worked with Humanscale since 1998, producing the Freedom, Liberty and Diffrient chairs. He revolutionised the world of design by focusing on the human experience, creating products that were both functional and elegant in their simplicity. He was always true to his core values when it came to design and was once quoted in the New York Times as saying, 'why would you design something if it didn't improve the human condition?'. The company also pride themselves on sustainability and producing products that consume less of the Earth's limited resources. Their core ethos is to solve functional problems as simply and elegantly as possible. The lovely people at Humanscale assessed my current work situation and worked out the best products for my space. Here's what they came up with. As soon as I saw that the Liberty Task was available in pale pink, I was sold. It's an intelligent mesh task chair engineered to provide automatic lumbar support and complete ease of use. It's super comfortable - you can adjust the seat to sit at the perfect position for your knee bend, the arms easily move up and down dependent upon how you like to sit. It's a simple action to get the seat to the correct position and the back support is amazing - you can lean back and forth whilst still being ergonomically supported by the chair. 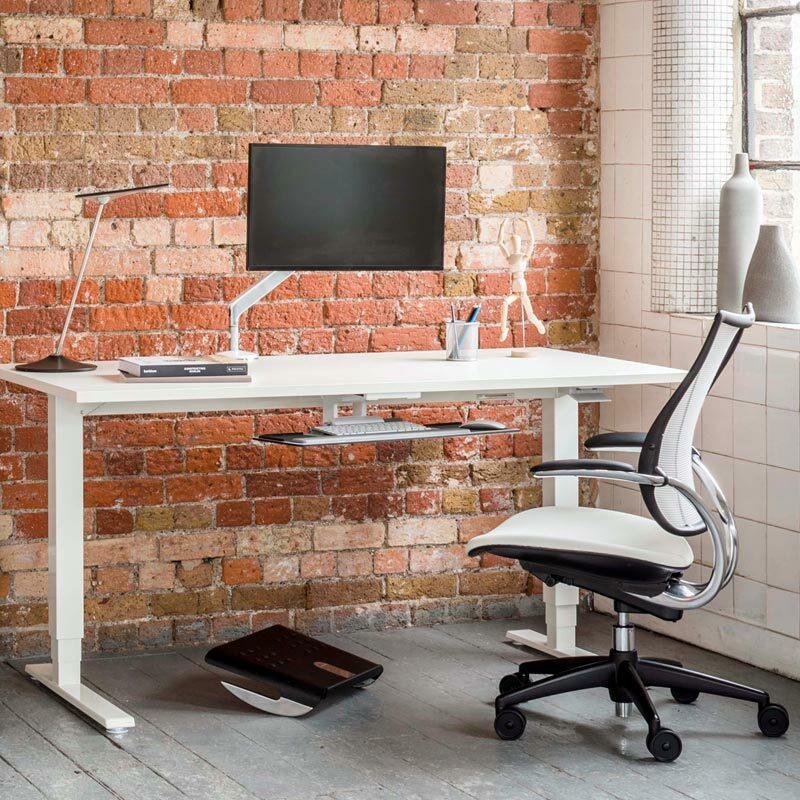 The Liberty Task uses Humanscale’s revolutionary Form-Sensing Mesh Technology and mechanism-free recline, which means it can be adjusted individually for each user. And even better, it looks gorgeous and is available in various other colours too. Pink was a winner for me. So I needed a new desk and this one was perfect. The Float is a desk that can be used both standing and sitting - ideal for a home worker like myself who is sitting down all day. It has a patented counterbalance mechanism that means it can rise and fall, enabling you to flex between upright and sitting so as not to interrupt workflow. It's really minimal and looks great, with a large work surface on which I can fit everything I need. The technician asked me to place everything I would usually have on the desk and then he adjusted the tension. The result? I can move the entire desk top upwards and down - including my Mac, a printer and essentials - simply by using a lever to the right hand side of my seat. It means that unlike my previous dining table desk situation, I can raise the desk so that the Mac is at my eye level. Humanscale believe that balanced movement is the key to wellness at work. Studies have shown that regular standing can burn calories, have a positive impact on well-being and prevent diseases such as heart disease and high blood pressure. Working from home can be very static; the Float desk means that I'm more likely to move around and thus encourages me to be more active. But what about the keyboard? Humanscale have also got that covered. The built in keyboard system is situated below the desk and again, is fully adjustable to suit you and you alone. It's an articulating keyboard system which allows you to sit in a healthy, neutral posture by bringing the keyboard and mouse to you, rather than you leaning towards it. There's a wrist rest and a built in mouse pad, all of which offer protection from carpal tunnel syndrome, neck and back pain and other musculoskeletal issues. You can raise it, move it around, adjust it to suit whichever position in which you feel most comfortable. If you decide you would prefer to use the mouse and keyboard directly on the desk top, the system simply slides out to remove. And I've also waved goodbye to all the trailing cables usually associated with my desk set up. Humanscale use a Computer Cord Organiser which makes managing all the cables much easier and enables me to have a clutter free work surface. Okay, so again I was hugely driven towards this model because of the Morning Pink colour choice but it's made a huge difference to my office. This beautiful light sits perfectly on the Float, and for good reason. It's won a prestigious Red Dot Award and a Next Generation Luminaires Award for product design and performance and also can be seen in the permanent collection of the Museum Of Modern Art. It's easy and effective to use, with a tactile dimmer and brighten switch on the base. It's most definitely an iconic piece and comes in eight gorgeous colours to suit your interior. So my office is now transformed. The new ergonomic Liberty Task chair is super supportive and the Float desk enables me to work flexibly at a comfortable level. And the Horizon LED light means that I won't be straining my eyes when the nights start drawing in. Aesthetically, it's a far more pleasing situation than the previously dining table/plastic chair set up and hopefully it will encourage my schedule to be far more productive, whilst at the same time promoting a healthier and ergonomically positive working environment. Perfect. Oh, and did I mention that the chair and the light were pale pink? This sponsored post was in conjunction with the lovely people at Humanscale. I would never consider promoting a brand that I didn't love and wouldn't use myself.